"Flavored stuffing mix makes this meatloaf savory!" Preheat oven to 375 degrees F (190 degrees C). Grease one 9x5-inch loaf pan with cooking spray. Mix beef, onion, stuffing mix, and egg by hand in a bowl. Press beef mixture into prepared pan. 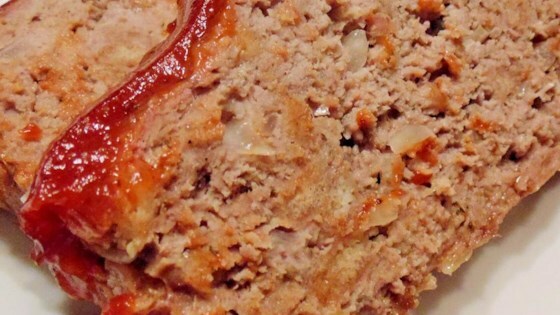 Top meatloaf with shredded mozzarella cheese and let rest while cheese melts, about 10 minutes. This can also be made in 4 mini loaf pans. Bake for 25 to 30 minutes for mini meatloaves. Flavor was ok but needed salt. Also needs some additional liquid as it was a little dry. This is a good solid meatloaf. It doesn't keep to we'll overnight, so it's best to eat it fresh. I added a bacon wrap and a sweet sauce. Did have to drain alot of grease off of it.